The Union Home Minister, Shri Rajnath Singh interacting with the officers and Jawans of Indo-Tibetan Border Police (ITBP), at Nelong Border Out-Post (BOP), in Uttarkashi on January 01, 2018. New Delhi: On the New Year Day, the Union Home Minister Rajnath Singh today visited the Forward Areas of the Himalayan borders in Uttarakashi district. He met the ITBP jawans deployed at the Nelong Border Out-Post (BOP) located at the height of 11,636 ft MSL. Shri Rajnath Singh had personal interaction with the jawans deployed at the icy heights of the valley. 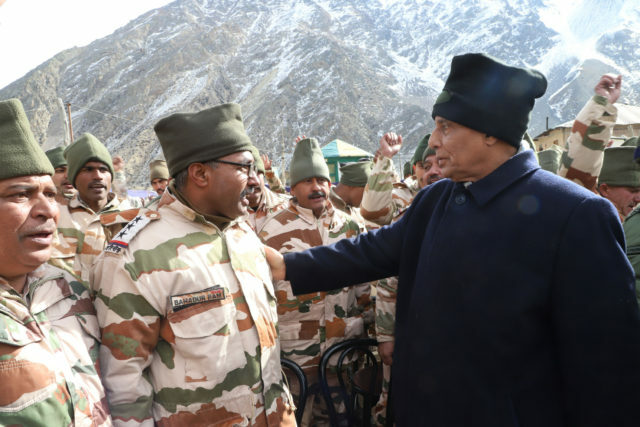 Union Home Minister, while addressing the ITBP jawans during a Sainik Sabha, lauded their dedicated service done in tough circumstances at high altitudes of Himalayas in sub-zero temperature. 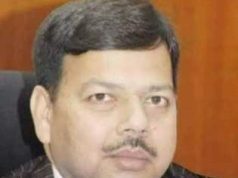 He said that the Himveers are working with high morale and the MHA is aware of the invaluable services rendered by the ITBP personnel to the nation. 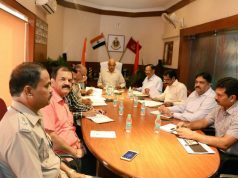 He assured them that the Ministry is trying to extend all possible support to the Force to make it stronger. Shri R K Pachnanda, DG ITBP and senior officers accompanied Shri Rajnath Singh on the visit. Yesterday, Union Home Minister met the families of ITBP jawans residing in the family quarters of the Unit premises at Matli, Uttarkashi and greeted them on the eve of the New Year. This was the first ever visit by Shri Rajnath Singh to Nelong Valley. In September-October last year, Shri Rajnath Singh had visited Mana, Lapthal and Rimkhim BOPs besides various other formations of ITBP- Mountaineering & Skiing Institute at Auli near Joshimath and Gauchar and had celebrated Dusehera with ITBP jawans.